I got home last night, opened the fridge, and the options were limited. Chicken sausage stuck out as the main protein that we had on hand. That usually gets eaten with some Brussels' sprouts and pasta but we were out of Brussels' and two pots (one for pasta and one for some sort of sauce) seemed too daunting so I decided to go the Risotto route. We had some fresh basil that needed to be used, a tomato, some white wine that was about to turn into vinegar, and tons of garlic so I grabbed all of that and set to work. Risotto is a nice "one pan" vehicle when you have some ingredients that seem like they go together but you just need something to bind them. This version was very tasty. 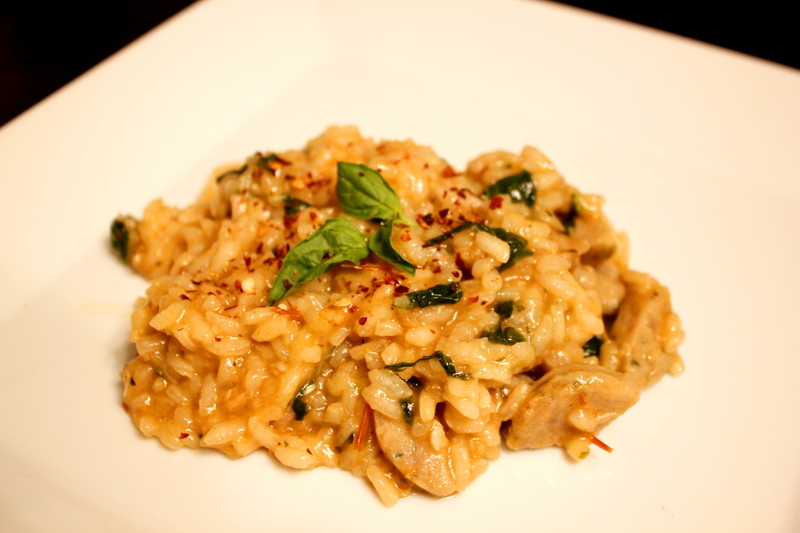 Risotto with chicken sausage, basil, garlic, and tomato. 1. Smash garlic cloves with side of knife and roughly chop. 2. Using salt as an abrasive, smash garlic into fine paste. 3. Heat olive oil on medium heat. 5. Add white wine and half of chicken stock while, stirring constantly. 6. After two minutes, add rice and stir constantly. 7. When most of the liquid has cooked out and rice begins to stick, add second half of chicken stock and continue stirring. 8. When rice begins to stick again, add a cup of water. 9. Continue repeating step 8, tasting every time to gauge when rice has almost reached the desired mouthfeel. 10. 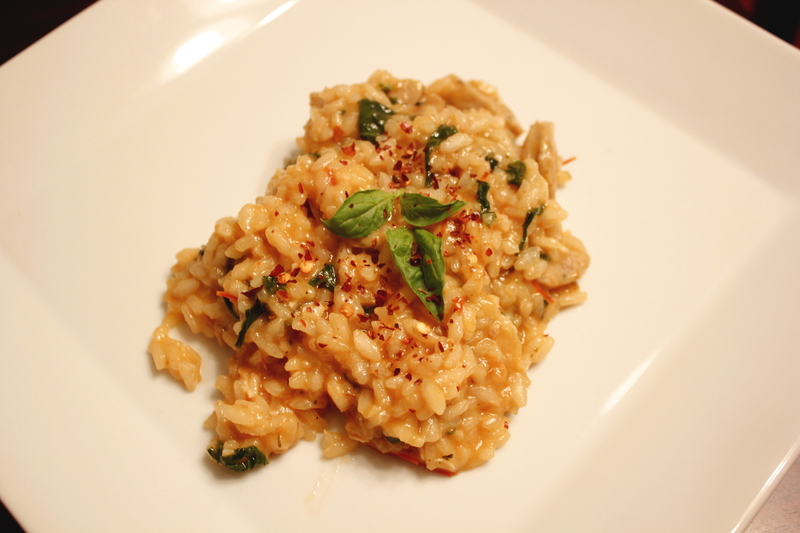 When rice is aldente, add chopped basil and season to taste with crushed red pepper, oregano, and salt. 11. Plate, garnish with basil leaves and enjoy.